Call it what you like: “problem-based learning”, “project-based learning”, “project-based science”, etc. Heck, use an acronym if you want to come off as in-the-know (or snooty depending on who you ask). Regardless of your fondness for the names or symbols, they all surround a solid educational tenet: learning should be experiential. If you cannot provide kids with a particularly valuable experience, then engineer one. Allow virtual experience. Create experience by proxy. Ideas experienced are far better than ideas discussed. Bottom line in naming almost anything: in order to market something, you can’t just market “something”. Simple enough? I thought so. In my district, an administrative push toward constructivism in our secondary schools has come complete with labels. It is important to note that I do understand the need to possess a common language. Getting to the heart of any issue is simpler if the involved parties do not have to talk the long way around issues. Get a common set of terms, figure out what they mean, inform all parties, stick with them. I get it. However, I would assert the thing that gets lost in translation here is the commonality. Science inquiry, reading and writing workshop models, math investigations, and problem or project-based approaches in social studies… are all learner-centered constructivist approaches. In reforming curricula for school toward the 21st Century, it is important -in my opinion- to focus on student ownership and engagement. Omission of these facets risks an educational system that is even more disconnected for future students than it is for so many today. However, there are arguments that fly in from both sides on this issue and they can be quite direct at times. Even a quick search will net individuals and groups who contend that constructivist practices are the hope for the future, and at the same time, the bane of the current day. Both sides of this argument hold merit. How can this be, you ask? Usually when pure arguments fall flat either way, it is due to the fact that the reality is far more complex. I would go so far as to say that the only people likely failing our children today are delivering instruction in a completely laissez-faire or purely direct way. If you could just sign the dotted line on your teacher contract and follow one or the other school of thought until the day you retire with little thought, then you could argue that teachers might be paid too much. In reality, those reading this blog likely know that this is simply not the case. Learning, and thus teaching, is an incredibly difficult and nuanced endeavor. My biology background allows me to see human beings as the complex entities that they really are. Perhaps that is part of my personal angle into charting a path for my students. I would suggest that my classroom is as constructivist-leaning as possible in secondary science in my corner of the world. We try to focus on process over content. As a generalist instructional coach in a high school, I have been perhaps able to more quickly make a move further down the constructivist pipeline considering I have to prep for far fewer classes. In fact, all you have to do for a glimpse of this reality is peek into a classroom reflection from October 24th. To be perfectly honest, October 24th of this year marked the first day where what most would refer to as “direct instruction” was utilized in my classroom. My students are “big kids” and I tend to let them in on these decisions. It is interesting here to see how many of my students were huge advocates for the “direct instruction” approach to biological molecules. Even kids who had been brought along this year with nary a hint of teacher-driven content still harbored a longing for it. However, perhaps they just inherently knew that this was a curricular piece where they would have floundered at first on their own. We talk about scaffolding in class. They get it. They also get those instances where the gap between the curricular goal and background knowledge is just too large to scaffold in an appropriate time period. I would have to say that has been building for some time. A favorite friend and coach (Jincy Trotter) and I, years ago, would lament how our practices at the beginning of the year would leave us “behind” most of our colleagues. Though we knew we were bringing our kids into the fold the best way we collaboratively knew how, we still felt pressure to “keep up” with the curricular bullet train. Student autonomy and initiative are accepted and encouraged. By respecting students’ ideas and encouraging independent thinking, teachers help students attain their own intellectual identity. Students who frame questions and issues and then go about analyzing and answering them take responsibility for their own learning and become problem solvers. The teacher asks open-ended questions and allows wait time for responses. Reflective thought takes time and is often built on others’ ideas and comments. The ways teachers ask questions and the ways students respond will structure the success of student inquiry. The constructivist teacher challenges students to reach beyond the simple factual response. He encourages students to connect and summarize concepts by analyzing, predicting, justifying, and defending their ideas. Students are engaged in dialogue with the teacher and with each other. Social discourse helps students change or reinforce their ideas. If they have the chance to present what they think and hear others’ ideas, students can build a personal knowledge base that they understand. Only when they feel comfortable enough to express their ideas will meaningful classroom dialogue occur. 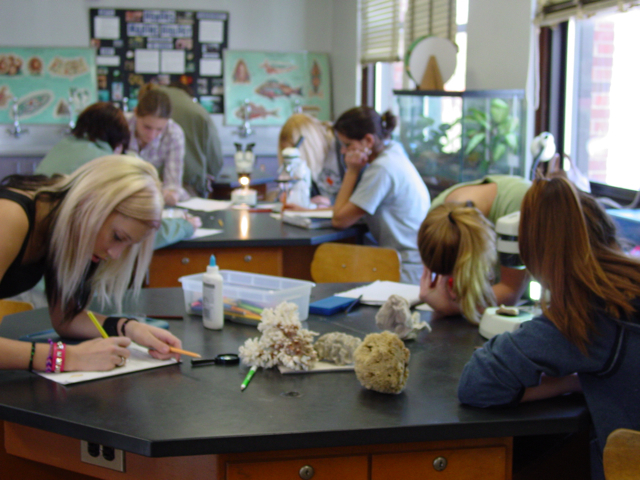 Students are engaged in experiences that challenge hypotheses and encourage discussion. When allowed to make predictions, students often generate varying hypotheses about natural phenomena. The constructivist teacher provides ample opportunities for students to test their hypotheses, especially through group discussion of concrete experiences. While Jincy & I were busy turning kids on to the beauty of science, assessing their prior knowledge and experiences, engaging them in collaborative situations to teach classroom procedures, and building rapport, our friends nearby were blazing ahead on the prescribed pathway. Though we mostly caught up by year’s end, we preferred to err on the side of deep student engagement and learning as opposed to curricular coverage. So to cut to my original goal, the document Sylvia refers to is located here in .pdf format. This document outlines “eight elements to guide great project design.” I would have to agree that these are all solid things to consider when planning a project or problem-based learning experience. The article references Seymour Papert’s constructionism. This is a very closely-aligned idea in many ways. The “questions worth asking” is also an important section, especially from the perspective of a coach. Outside consultation is always a valuable commodity in any worthwhile undertaking. To me, the bottom line is that this type of learning is often deeper, richer and more memorable than other approaches. It takes longer to develop. Even with a thorough understanding of the ways in which a curriculum can contain both coverage as well as depth, this is no easy task. Our secondary schools largely contain content experts with a smattering of pedagogical input throughout their brief teacher certification experience. So to the millions of content experts without a background in curriculum, hang in there. Creating a learning environment where the prior knowledge of students is honored is a big step. Respect of student autonomy and initiative should be encouraged, as well as higher-level thinking and rich student dialogue about content and understanding. If you are feeling frustrated about a curricular piece that doesn’t seem to fit this approach, it very well may not. Our curricula have input from many outside influences and implementing one approach to solve all issues rarely works. If you wonder where, when and how constructivist practices should be implemented into your classroom, find a consultant. Find someone to help you reflect along the way. Grab the shirtsleeve of your coach, call your curriculum coordinator, bug an experienced colleague. Whatever you do, find someone. Implementing engaging and rich experiences for our kids deserves the best collaboration and reflection you can get your hands on. Working with teachers who are standing in the doorway of a constructivist classroom, I can honestly say I find it fascinating. The inscrutable countenance reminds me of a kindergartener who has never encountered “center time” before. The joy that comes from entering the world of center time, and the pure pleasure of knowing that day after day it will come again — well, that is what I see when I watch our teachers step into their constructivist classrooms. One thing I am perplexed by, however, is something that continues to crop up in discussions around our building in the face of deep, rich constructivist learning — where does the scope and sequence fit into the picture? Our school district’s assistant superintendent, Mrs. Cheri Patterson — who, on a very important aside is one of the smartest curriculum people I think I have ever met — states that it’s really not an issue. She shared with me (and possibly many others in the room at the same time) that a scope and sequence is merely a way to keep a learning progression through curriculum, not a God-given law to follow. It’s meant to keep teachers from teaching the “leaf unit,” or whatever it’s called in other districts, to students all year long and never reach all the other wonderful, rich learning that children should encounter. I agree with that. But I also know my teachers. By golly, if it’s in print and has a date by it, my teachers work to make that date like Roger Bannister worked at breaking the four minute mile — especially if that race has a benchmark at the end of it. True that it requires a F2F discussion. However, I can tell you that when Jincy & collaborated, we didn’t have benchmark exams to chase. Nor do I in the Dual-Credit Biology course I currently teach. Does that make it easier? You had better believe it does. Does that mean this type of rich, in-depth learning can’t take place within a more rigid curricular pathway? I don’t think so. If people of all job descriptions aren’t sitting around, talking, bickering, and battling how these concepts all play out… then I think we are just wading. I think you have hot the nail on the head of perhaps our biggest “teacher stress” element in 2008. That’s an interesting take on the meaning of the scope and sequence, when as of three years ago the common courses were expected to be teaching the same lessons (content and strategy) on a daily basis. To hear that the scope and sequence is more of a fluff regulator sounds like a rejection of the common course approach we attempted. I am all for creating opportunities for depth and process, because of the relevance factor. As a writer of the Benchmark tests I don’t feel like they are designed to handcuff our instruction, or have the pressure to cover every minute detail. I don’t think that constructivism should be compromised for the sake of high benchmark scores. This post and the comments have been quite refreshing to hear. @Jeff – I agree that the scope and sequence certainly can act as a regulator of fluffage. However, in my purest of hearts, I do believe that it acts primarily as a guild to a best-practice progression that builds course concepts in a skillful way. I think it is a way to weave sometimes heterogeneous pieces of fact into a coherent theme that makes sense. The thing that stresses me most is the fact that a tight sequence doesn’t seem to encourage innovation. I can think of many times in my career thus far where I have decided to flip the curricular sequence to better land big ideas and overarching problems into the laps of students early on. Botany, for example… when delivered from a “parts to whole” approach doesn’t seem to go over so well with our kids. When I made the switch to starting with things they could immediately connect to, the more difficult, abstract pieces minutiae seemed to be more palatable. Thanks for the comments on the Projects article, very insightful. And by the way, don’t believe any of the “rules” about blogging. I like your style and am happy to read longer, more reflective posts. Who needs another “link of the day” post? Who made these rules, anyway? On Twitter you requested feedback based upon our perspective of our district’s current direction (aka the “course du jour”). I apologize if this exceeds the rules for standard comment size/limit. My district is a constructivist’s purgatory. No, not an exaggeration; more like an understatement. While this creates, at times, unbelievable levels of frustration, I’m aware that all of life is cyclical. I must hold fast and true to the methods I know facilitate student interest while encouraging genuine learning. Through interest, inquiry, investigation & discovery students take ownership of the content; only then does authentic application occur (no matter when a pacing guide declares learning objectives will be met.) I witness this year after year, regardless of the latest & greatest innovation bandwagon the district leadership jumps on. Or else what, I ask? Earth ceases her rotation, gravity is turned off, we implode into a black hole and all is lost? Please… When the constructivist approach is discouraged or abandoned, we lose students. I find this inexcusable and unacceptable. In response, I have grabbed on to my constructivist boot straps, recognizing these students must first learn how to learn. This includes accepting that mistakes are a fact of life, and having incorrect answers is okay! This is when investigative tools are applied and, through discovery, misconceptions are wiped away. Students are then willing to take that risk and aim for the correct answer. If still incorrect, they collaborate with other peer groups until corrections are made. When students understand that quitting is not option they are empowered to be successful. I am forever searching for brief, powerful learner-centered investigations in true constructivist fashion, while attempting to stay not too far off the mandated pacing guide. This quest is how I arrived in this wonderful collaborative world of online PLNs. What I gleam from all of you is the inspiration that fuels my motivation. One day the Neanderthal leadership of my district will return to their place of origin, having grown tired of the madness they’ve created. Those of us who remain true to Bruner’s fundamental principles will be here to pick up the pieces and continue to facilitate our students through the incredible discovery process. @Marylou – Thanks for the reflective reply from North Carolina. A “constructivist’s purgatory?” Wow. I admire what seems to be both your personal commitment toward individual student growth and a rather outspoken critique of the state of affairs at back home. I must say that I am more than a little happy to be a part of a systemic move toward constructivism originating from some of our highest administrative seats. Of course, blind accountability has certainly filtered its way from Washington and Jefferson City into our local affairs as well. Let there be no doubt that this muddies the waters for those first-time, experimental constructivist swimmers. However, I feel that a broad-based focus on student-centered learning approaches will ultimately put us in a position to better weather the ebb and flow of any and all potential political influences toward the future. I agree with Sylvia–this post has depth that keeps me engaged (and I’m also not feeling manipulated, as I sometimes do when I read posts that are heavily laden with links…I’m all for “link love” but when it starts looking like “link advertising” I start to itch a bit). ANYWAY…..in my corner of the world , constructivism takes place with communities of practice that thrive quietly behind doors that usually remain closed. I’m an independent consultant, and I spend my days coaching and providing professional development opportunities to teachers, admins, and other coaches. I’m really touched that Sylvia would point you toward my blog, which I’m using in a feeble attempt to practice what I preach and reap the rewards of doing so. I encourage educators to be transparent, seek peer review, and establish critical friendships. I really feel that consultants like myself, administrators, and other school leaders must begin to position themselves less as experts to be obeyed/followed and more as members of the larger community who are willing to share their expertise as often as they are willing to listen and learn from others. I’m learning a great deal from the teachers that I work with, my personal learning network online, and the kids that I get to teach as a coach. Thanks for dropping by, Sean. I just added you to my reader! “Link love.” Interesting… I hadn’t thought of it that way, but I get what you are saying. I have a group of instructional coaches here in my town that would love to read more about your world. It seems that we have tons in common. I am about to spread the word their direction now. Many of your stated beliefs sound quite in line with our current model/philosophy. Excellent to “meet” you. I’m with Sylvia on this one. Throw the rules out the window. That post was incredibly well written and well worth spending the last half an hour reading. Ok, ok, kidding about the half hour thing, but seriously, I tend to ramble on a bit with longer posts, but this was extremely well crafted. 1) I’m glad you referenced it directly in your comment on Teach42. I may not have found it otherwise. 2) As you’ll see in the Challenge for Day 30, the rules truly are meant to be broken. When in doubt, write your own rules. Thanks for sharing the link. Incredible post. I agree. Great post. You make many honest and valuable observations, spoken very clearly. I appreciate your writing because you remind me of what I want to do in my teaching. In foreign languages we would call it ‘performance-based learning’. @Steve & John – Thanks so much for the kind words… really. I too, agree that rules are largely meant to be broken in this medium. That is one of the things that makes it so appealing to me.